We are going out to great dinners at night here in Florence, but with the exception of Fuor D’Acqua, we haven’t found anything that hands down blows away the food in New York City. Fuor D’ Acqua is an exceptional place, exceptionally expensive too, but if you love fish and are willing to pay up for the experience, it’s worth every penny. But the really "blow me away" experiences have been in the market and on the streets, specifically pannini shops and gelato. Yesterday we got up late, around noon, and went straight to Mercato Centrale, the central food market in downtown Florence. During our preparation for the trip, we had come across this blog post, which is a step by step guide to the Mercato. We followed it verbatim and although we didn’t buy any meat, fish, or vegetables, we had a blast checking all the places out. 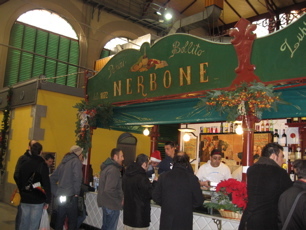 We started at Nerbone and figured we’d skip breakfast and go straight to lunch. OMG. The boiled beef sandwiches in salsa verde are killer. I’d have eaten three if the family would have let me. Nerbone is a busy place, and you have to be agressive, push and shove a bit to get to the front and place your order. But man is it worth it. We went crazy upstairs at Emilio’s dried fruit stand. The colors and shapes and sizes are perfect eye candy. I think we bought six or seven bags of dried fruit. It’s going to last us until we fly back to NY nine days from now. Later that day, we had a second lunch at I Fratellini. 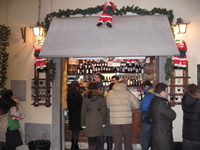 This place is a little hole in the wall pannini shop right off the main shopping district. We’d read about this place too in the blogs and they were right on. There’s a little pannini place on 18th Street between Fifth Ave and Broadway in NYC that is a take on this kind of place. But it’s nowhere near as authentic as I Fratellini. The sandwhiches are great, particularly the tuna with salsa verde, but my favorite part was the $1.60 glass of wine that you can put in the wood rack on the side of the store and drink while you stand on the street and eat your sandwich. Great spot. Our favorite Gelato spot so far is Vestri, which is really a chocolate shop that serves Gelato. A couple of the most highly recommended places are closed right now which is too bad. I am eager to try this place Grom before we leave town.